It was almost exactly one year ago that Big Dog Mom was born. I can remember the day like it was yesterday. Sweaty palms, racing heart, and nervous anticipation as I hit publish to my first blog post: Do You Own A Big Dog Or Want To? Big Dog Mom Can Help! Looking back on that moment makes me laugh. Did I think the Google gods were going to open the flood gates of big dog owners and send them flocking to my one post blog? The crickets heard far and wide that day were proof that the Google gods must have been resting. But I didn’t know that then. As a 16-year veteran in sales and business, I know first impressions are everything. After spending three months learning website design and setting up the platform that is BigDogMom.com, the sleepless nights continued with perpetual doubt. Would dog owner’s resonate with me, my writing, and my content? Could a former sales professional turned work-at-home mom and social media virgin really make it in this vast digital blogosphere? Like all great books by Ayn Rand, this string of rhetorical questions never ends. In Big Dog Mom’s infancy, I leaned on the BlogPaws network of bloggers for inspiration and guidance. With more than 3,000 registered members, BlogPaws opened up an entirely new world of dog and pet lovers who were putting the proverbial pen to paper to write what they were passionate about; their pets. BlogPaws revealed what was possible if I stayed true to my mission. 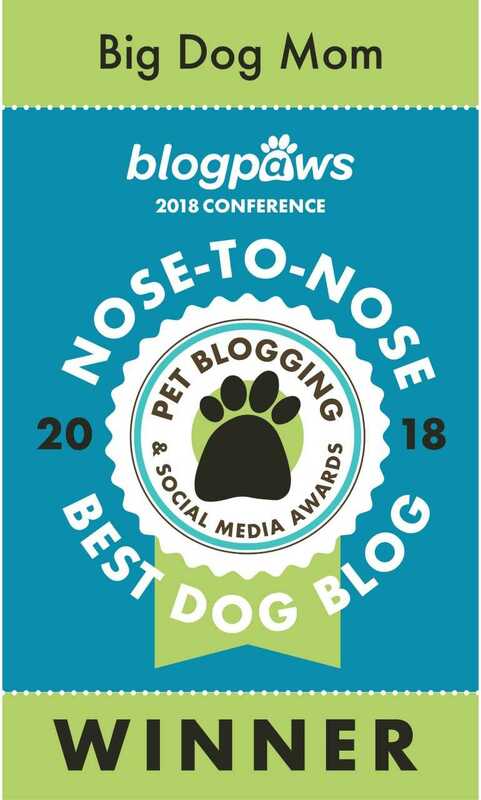 As if this social media virgin somehow attracting over 1,000 followers on Instagram in less than a year isn’t shocking enough, in March I was selected as a finalist for not one, but two BlogPaws Nose-to-Nose Awards; Best New Pet Blog and Best Dog Blog of 2018. These awards are designed to honor the best of the best in the pet blogging and pet social media influencer world. 52 finalists in 13 categories were selected by a panel of industry professionals and the 13 winners were selected by judges based on creativity, expertise and performance in their respective categories. Winners for the Nose-to-Nose Awards were broadcast in an exclusive red-carpet ceremony and received a trophy, recognition by peers, social coverage, press coverage, and a $400 food donation to an animal shelter of their choice. While Junior, Sulley, and I were unable to attend the annual BlogPaws conference this year in Kansas City, Missouri, we watched the live stream virtually. As longtime Westminster Kennel Club Dog Show commentator, David Frei, announced Big Dog Mom as the winner for Best Dog Blog, not even my impending influenza bug could quell my excitement. After the hugs and heartfelt congratulations from my husband and kids, reality quickly set in. Is Big Dog Mom really THE BEST Dog Blog of 2018? As humbled and proud as I am to have received this tremendous accolade, I cannot help but question what this now means for the future of Big Dog Mom. While I will never be a literary genius, a professional photographer, or a gut-busting comedienne, I will try to harness hints of these on occasion to keep Big Dog Mom entertaining. But to combat my overwhelming self-doubt, I like to think about the future of Big Dog Mom linearly with three primary goals for the future. On several occasions in the last year, I have been offered money and free products in exchange for my endorsement. Items such as dog treats, dog toys, and a year supply of kibble, serve as income for many bloggers. Unfortunately for me, unless the dog toys can truly stand up to Sulley’s scourge, and the food and treats are all natural and/or raw for raw fed giant dogs, I am really not interested. As a saavy business woman, I am well aware of the financial limitations this places on my young business. And that is ok. What is important to me is staying true to my core values. If the product(s) are not something that I truly love and would buy personally, I am not comfortable recommending them. Period. Believe it or not, this clever tagline was conceived in the shower as most entrepreneurial epiphanies are. But behind this ingenious trademark is a very real commitment. My promise to you, the Big Dog Mom community, is to serve rich, informative, and entertaining content that will help and empower you to provide the very best care for the big dogs in your life. Put simply, Big Dog Mom is dedicated to large and giant breed dogs by inspiring and empowering the people who love them. Big Dog Mom may not win the award for most prolific, but I hope to compete for most dedicated. Most impactful. Most inspiring. Oh, and maybe, most slobber. That can be an honorary award for the two most deserving canines, Junior and Sulley. While still in development, the future of Big Dog Mom is going to include both digital content and tangible products. As it turns out, designing and manufacturing non-digital products is a little easier in my head than in reality so this process has taken me far longer than I anticipated. That said, stay tuned. Follow me on Facebook, Instagram, and Twitter where I will be sharing sneak peaks of all the behind the scenes action. Subscribers to Big Dog Mom will also receive exclusive content and discounts when my products launch. You definitely want to be on that list! I would be remiss if I didn’t acknowledge that none of this would be possible without you, my fellow big dog lovin’ friends. You and I are a special breed whose love and admiration for our over-sized canine companions knows no bounds. The majority of the population will never understand why we voluntarily choose breeds with shorter lifespans, higher veterinary costs, and more mess. Did I mention the mess? The reason is simple; these people have never been loved by a big dog. Once you have, there is no going back. Thank you for sticking with me on this journey. I know your time is valuable and I appreciate every second you welcome me into your home and your heart through this blog. With you and your big dogs by my side, the future for Big Dog Mom is bright and filled with opportunity. Impostor syndrome endures, but will not prevail. Concatulations on your win! A lot goes into planning a good blog and you definitely worked hard in 2017. I liked seeing your acceptance video at the conference. Congratulations! What a well deserved award! I remember the first time I hit publish on my first blog post and wondered, ok, what now? You are doing a wonderful job, and your dogs are awesome! Aww, thank you, Kelly! Yes, I was so nervous publishing that first post. Oh, who am I kidding, I get pretty nervous publishing all of my posts. I don’t know why. You’d think that feeling would go away once I’ve done it a few times. Wow, I am so impressed!!! I had no idea your blog was only a year old. I just started and feel like I’m getting nowhere fast. What’s your secret? Aww, thank you so much, Holly! I really have no secret. The only thing I will say is that after the first couple months I stopped looking at Google Analytics in favor of just letting things happen naturally and organically. I linked to my two BlogPaws posts which I highly recommend for newbie bloggers as well. I tried to make them funny and lighthearted, but also informative based on the wisdom I have gained in the last year. Well done. I told you you were amazing! Now will you believe me eh??? Congratulations, it’s quite an honour! To think your blog is only one year old and it’s made such an impact is amazing. Most of my brilliant ideas also hit me in the shower. See, I knew I wasn’t the only one who gets strokes of genius in the shower! 🙂 Thank you so much, Hindy! 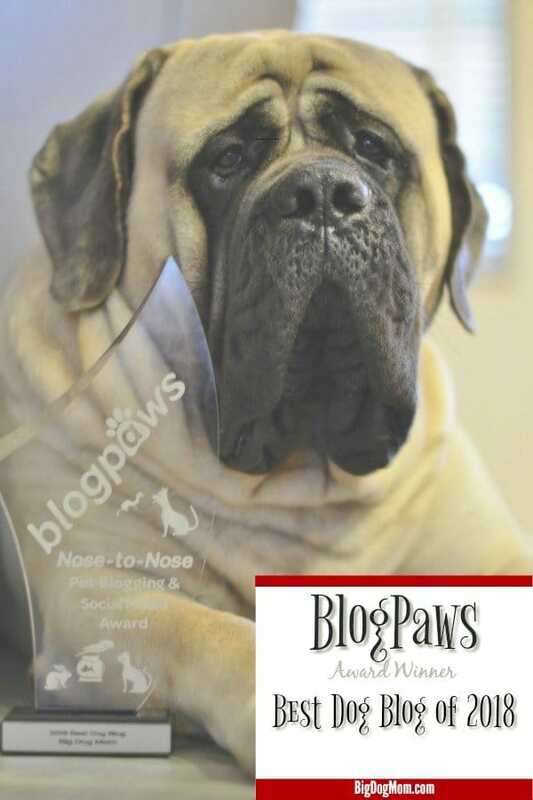 What a great accomplishment I attended BlogPaws for the first time this year and love the Nose To Nose Awards. Very happy for you that video was great! Thank you so much, Adriana! I hope to attend next year. Congratulations on your win! I enjoyed all the aspects of the video! I never realized how big Junior and Sully are compared to you until watching the video. I don’t remember our Bullmastiff (which must be smaller) being so large compared to adults. Congratulations Stephanie on being a winner of the best dog blog. I’m a cat lover however enjoy seeing your posts on the blog from time to time. As a pet parent that’s considering adopting a dog in the future I find your posts very entertaining and helpful and I love seeing pics of your boys. Congratulations again. Thank you so much, Kamira! I can’t wait for you to get your dog one day! Congratulations on your journey and award! I am enjoying the inspirational stories and hope to attend the conference in person next year. You and me both, Sadie! Next year will be our year. Thank you so much! I would have never guessed your blog is only 1 year old. It looks like you’ve been doing this for 10 years 🙂 Congratulations on your deserved award!